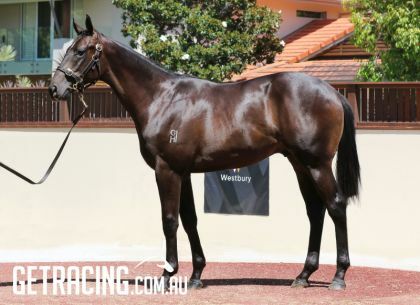 This All Too Hard colt was purchased from the Westbury stud draft at the Magic Millions Gold Coast sale. Looks say it all, he certainly has the wow factor and has been put together really well. He is a really strong muscular type of colt. He has good bone and size. Great angles, short cannon bones and strong forearms. He has great angles big strong girth and loads of presence. He is a great mover and there is a lot to like about this colt. Adrian Bott’s sale comments, “ Really exciting colt by All Too Hard that we were able to partnership with Blueblood Thoroughbreds. Closely related to one of Gai’s champion mares Lotteria one of the best of her generation. A lovely style of individual, very forward precocious. Hope we will see him on the track earlier and has the scope to train on as a 3yo”. This colt has completed being educated at Evergreen Stud by astute breaker Gordon Pratt, he has reported, “We have just finished breaking in the All Too Hard x More Caviar colt for Blueblood Thoroughbreds. He broke in really well, he is a well-mannered colt. The colt did not show any signs of being overly coltish or boisterous which is good. Under saddle he is very forward thinking, he travels nicely up on the bridle and we found he came to hand quite naturally which is good. I like to see that in horses. He handled the breaking in process really well. From hear he will go out to Cavallo Park and will come back within a months’ time before he will head over to Gai and Adrian’s stables in the next preparation". He has a good Nick Rating of A. The rating is based on breeding patterns from the Sire and Dam sire lines. This lovely colt is bred on the same cross as 3 Group One winners, MIRACLES OF LIFE, REBEL DANE and ATLANTE. LOTTERIA. 8 wins from 1200m to 1600m, AJC Flight S., Gr.1, VRC Myer Classic, Gr.1, AJC Surround S., Gr.2, STC Shannon S., Gr.2, Newcastle JC Spring S., Gr.3, AJC Show County H., L, Kogarah H., 2d MVRC WS Cox P., Gr.1, STC Arrowfield Stud S., Gr.1, NSW Tatt's RC Tramway H., Gr.3, 3d AJC Epsom H., Gr.1, 4th STC Canterbury S., Gr.2. MISS MARGARET. 7 wins-2 at 2-from 1000m to 2500m, VRC Chrysler S., Gr.1, South Australian Oaks, Gr.1, MVRC Tesio S., Gr.3, SAJC Auraria S., Gr.3, VRC Mark Sensing S., L, VATC United Energy P., Storm Queen H., VRC Sirena Tuna 2YO H., 2d Australasian Oaks, Gr.1, VRC Red Roses S., L, 3d VRC Hardy Brothers Classic S., Gr.3, VATC Angus Armanasco S., Gr.3. LORD REIMS.13 wins from 1200m to 3200m, SAJC Adelaide Cup, Gr.1-3 times, VATC Caulfield Cup, Gr.1, SAJC West End Export S.H., Gr.3-twice, STC Lord Mayor's Cup, L, ARC Chase H., 4th STC HE Tancred International S., Gr.1. ALL TOO HARD was Australian Champion 3yo colt 2012-13, half-sister to Undefeated and Champion mare BLACK CAVIAR. He was internationally recognised & rated the equal highest 3yo colt in the world and had a great race record being a four time group one winner. Being Black Caviar’s half-brother he had a lot to live up to and has not disappointed. He is already proving himself to be a formidable sire early at stud earnings of over $9.0 million, 6 stakes winners, 11 stakes placegetters. ALL TOO HARD Champion 3YO Colt in Australia in 2012-13. 7 wins-3 at 2-from 1100m to 1600m, MRC Caulfield Guineas, Gr.1, ATC All Aged S., Gr.1, MRC Futurity S., Gr.1, CF Orr S., Gr.1, ATC Pago Pago S., Gr.2, VRC Sires' Produce S., Gr.2, Talindert S., L, 2d MVRC WS Cox P., Gr.1, ATC Sires' Produce S., Gr.1, 3d ATC San Domenico S., Gr.3, 4th ATC George Main S., Gr.1. MORE CAVIAR by MORE THAN READY. Winner at 1200m. This is her first foal. MORE CAVIAR is the daughter of LOTTERIA, multiple Group One winner. Champion broodmare sire MORE THAN READY has a great record in eleven years. More Than Ready as a broodmare sire has had earnings of over $105 million and 48 stakes winners including 6 at group one level and also 6 at group two level. He has a phenomenal record with 20 stakes winners as 2yo. His progeny have won a Blue Diamond, Manikato S, Sir Rupert Clarke and Darley Classic to name a few. Gai’s first runner in a race won. Her first runner in a metropolitan race won. Her first runner in a Group One race won. Her first runner in a jumps race won. Considering the education Gai received during her 12 year apprentice with T.J. leading up to January 1992, it is little wonder the Lady Trainer was an instant success. Since her humble beginnings as a solo trainer in January 1992, Gai has gone on to achieve as much as humanly possible with racehorses. While many would rest on their laurels after such success, Gai simply wants to win more and more. Owners can rest assured that the Lady Trainer wants to win races just as much if not more than they do! Confirmation of this dedication to excellence came after just fifteen years of training when Gai was inducted into the Australian Racing Hall of Fame (2007). As we stand, in just over 20 years of training, Gai has amassed over 120 Group One wins and currently sits third on the all-time list (Group One winners) behind T.J. Smith and Bart Cummings. By far Gai’s greatest achievements have been recorded in the best races of the year in both Melbourne and Sydney. Gai has won Sydney’s two best races, the Golden Slipper and Doncaster Handicap six and seven times respectively. Gai is by far the most successful trainer ever in the Sydney Spring. ‘Make hay while the sun shines’ is a phrase one often can hear Gai quoting. This attitude is reflected by Gai’s results in the best races contested during the Sydney Spring Carnival. The Flight Stakes (7 wins), the Epsom Handicap (7 wins) and the Metropolitan Handicap (8 wins) have become races at the mercy of Gai each and every year. Gai gives each and every horse that comes into her care every possible chance to succeed. Only six horses in the history of Sydney racing have won the two-year-old Triple Crown and Gai has trained two of them (Dance Hero 2004 and Pierro 2012). 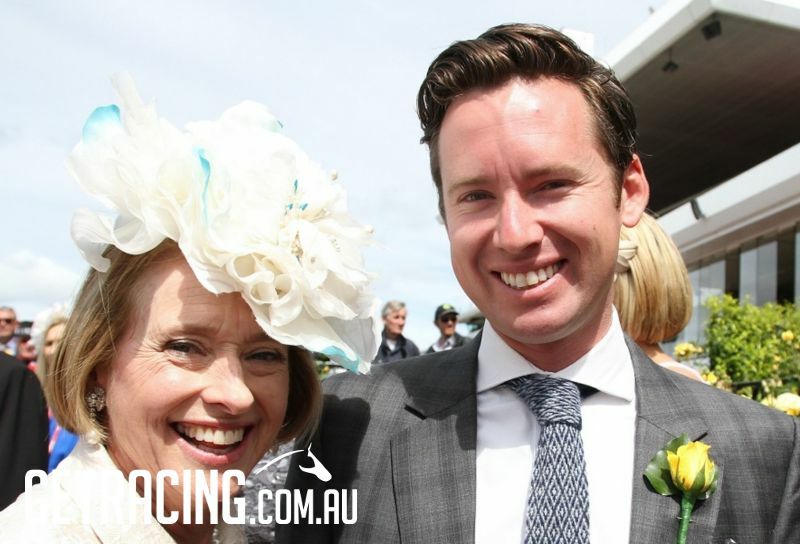 Gai in fact has won more Group One races for two-year-olds than any other trainer. Eligible for the lucrative BOBS and BOBS Extra Schemes and will be nominated for the $3.5 million Golden Slipper, $1.5 million Blue Diamond, $1 million Golden Rose & Blue Sapphire and the Magic Millions race series. Share Price Includes: Purchase Price, Agistment, Nominations, X-Rays and Scoping, Mortality Insurance (12 months) and any other associated costs. ALL TOO HARD (AUS) (Bay 2009-Stud 2013). 7 wins-3 at 2, ATC All Aged S., Gr.1. Half-brother to SW Black Caviar. Sire of 240 rnrs, 146 wnrs, inc. SW Villermont (MRC Sandown Guineas, Gr.2), Tarka, Demonetization, Frosted Gold, Unfair Dismissal, All Too Huiying, Curdled, SP Amangiri, Cristal Eyes, Outrageous, All Too Soon, Hardly Surprising, Roy's Riviera, Behemoth, Illuminaire, Eclair Sunshine, Fine Scent, Waimea Bay, Warranty, Za Zi Ba, Fling, etc. MORE CAVIAR, by More Than Ready (USA). Winner at 1200m in Aust. This is her first foal. Yokohama. 2 wins at 1200m, 1600m in 2017-18 in Aust. More Caviar. Winner. See above. Laguna Mountains. Winner at 1600m in 2018-19, 3d ATC Bisley Workwear H.
Field of Fire. Winner at 1400m in 2017-18, 2d Wanganui Chronicle H.
Hostwin Meraki. 5 wins-2 at 2-to 1500m to 2018-19 in Aust. and Macau. LOTTERIA (f Redoute's Choice) 8 wins. See above. Farranfore. Winner at 1200m in 2018-19, 2d ATC American Pharoah at Coolmore H.
Samski (g Exceed and Excel) 4 wins to 1200m, 3d MRC Chairman's S., L, BRC Asteron Life P.
D'Aguilar. 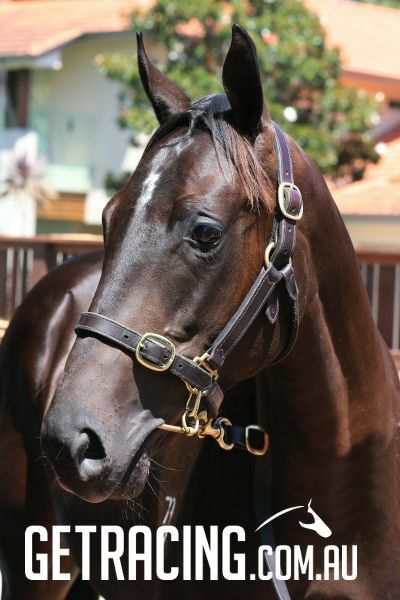 2 wins at 1350m, 1600m in 2018-19, MVRC Essendon Mitsubishi H.
Maranello. 2 wins at 1400m, 1600m, Singapore TC Novice H., Initiation P.
Proud Eagle. 4 wins from 1200m to 1800m, SAJC Mac Drink Driving? Grow Up H., 2d SAJC Aqualutions H., 3d SAJC James Boag's Premium H., Goldin Farms H.
Rose Reward (f Sir Tristram) 3 wins. See above. OVER QUOTA (g Testa Rossa) 9 wins at 1600m, 1700m, A$354,815, Kilmore Cup, L, 2d Seymour Cup, L.
TAATLETAIL (f Faltaat) NZ Bloodstock Filly of the Year 2004. 6 wins-1 at 2-from 950m to 2000m, NZ$336,050, New Zealand One Thousand Guineas, Gr.1, Waikato RC Sir Tristram Fillies Classic, Gr.2, Hawkes Bay Highview S., Gr.3, Masterton RC Lowland S., Gr.3, 2d Levin RC Bayer Classic, Gr.1.